Gay blogs have had a morbid curiosity with Ms. Palin for long enough now for this sort of thing to be expected, and yet…I don’t think anyone is ever truly prepared for Palinisms like these. Speaking at a fundraising event Monday evening, Sarah Palin credited President Bush by name for the death of Osama bin Laden, but omitted the name of President Obama in her remarks. All bias aside, Republicans, or anyone for that matter, who push heavy-handedly push revisionist history like this are just harming their own credibility. Homegirl didn’t even wait two days before breaking out the “Bush beat Bin Laden” wackadoodle. It was only two days ago! We all remember it happening, and Bush had nothing to do with it. It’s also worth noting that one of John McCain’s campaign pledges was to stay out of Pakistan no matter what, so had be been elected, Osama Bin Laden would still be hyucking it up in the suburbs. Is it really that difficult for Palin to acknowledge that President Obama achieved something that President Bush couldn’t accomplish in two terms? It’s not a competition, but nonsensical Republican spin like this surely frames it as one that is apparently being refereed by a blind and deaf person from an alternate dimension. 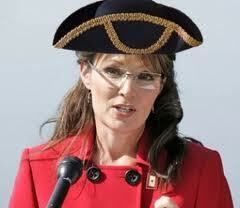 Really, Ms. Palin, this is just ridiculous.